It is widely believed that Russians first began consuming rice during the reign of Peter the Great period in the 17th century. Over the course of three centuries, rice has become an important part of Russian cuisine and culture. RBTH compiled a list of the most popular ways to use rice in Russia. 1. Cover rice with milk and jam. Bon appetite! Rice porridge is boiled in milk and sweetened with sugar. Russians like to put some dry fruits, honey or jam in the rice porridge. They usually eat it for breakfast or as a dessert. 2. Mix rice with boiled eggs and make a pie - why not? Gubadia is a traditional Tartar sweet pie with layers of boiled rice, chopped eggs and raisins. Uha, Russian fish soup traditionally consisted of fish, potatoes and onions. Rice was a later entrant into the soup, but many families insist on adding a few spoons full of it into their Uha bowl. Russian Tefteli look like pure meatballs, but they aren’t. They are 50 percent meat and 50 percent rice. The correct term would be meat and rice balls. Russians believe that if a dish has more salt than required, one should put some rice wrapped in butter-muslin in it. Rice can easily reduce excess salt in a dish. Tossing rice is a old custom that has long been popular in Russia. 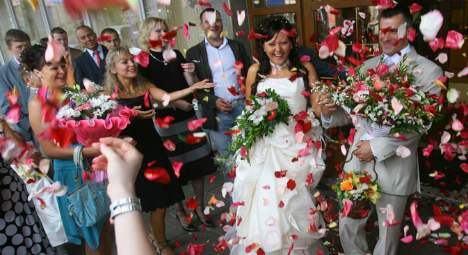 The idea behind throwing rice at the bride and groom at weddings is that it brings good luck and abundance. In the Russian Orthodox tradition, on the day of a funeral, the family prepares and serves Kutia, a sweet porridge made with rice and raisins. Rice symbolizes eternal life and raisins, heavenly peace.